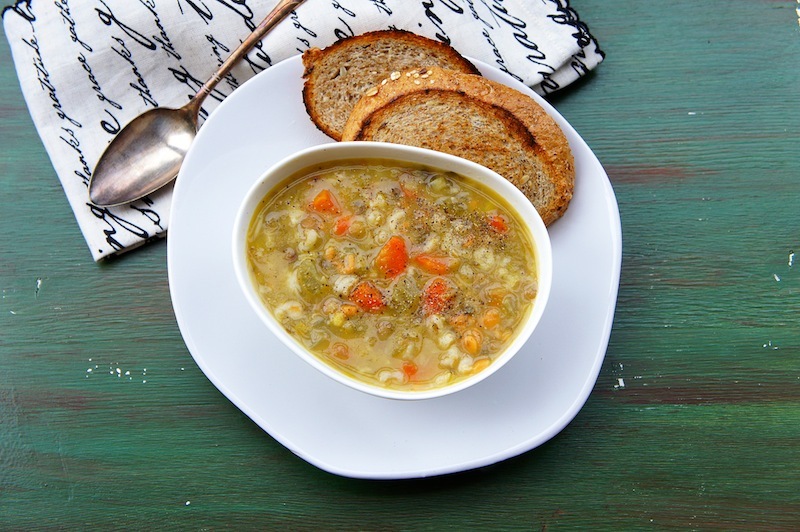 This Hearty Vegetables Soup is thick with chock-full of healthy ingredients, and it will keep you feeling satisfied. It's made with fresh leeks, carrots, celery, and Bob's Red Mill Vegi Soup Mix. The vegi soup mix is made from green and yellow split peas, barley, lentils, and some alphabet pasta. Heat the olive oil in a stockpot over moderate heat, add the leeks and garlic. Stirring frequently until it is sticky and golden in color. Mix in the carrot and celery, Vegi soup, and parsley. Continue to stir the vegetable mixture with a wooden spoon, for about 5 minutes. Then add vegetable stock. Bring the soup to the boil, reduce the heat and simmer for about 35 to 40 minutes. Season the soup with sea salt and pepper and serve warm.